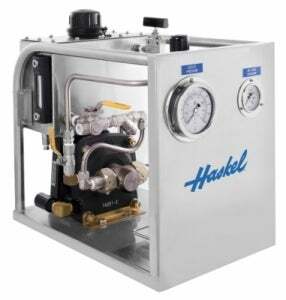 Haskel delivers high-quality, reliable products for high-pressure transfer and pressurisation of fluids and industrial gases, especially in safety-critical environments. The company develops a comprehensive range of liquid pumps, gas boosters and air amplifiers products that are powered by air with no electrical or mechanical connections. Its products are easy to install and control. Their compact size, minimal weight and ability to operate in any position make them suitable for a wide range of mobile and fixed applications. Haskel manufactures BuTech, a leading brand of ultra-high pressure valves, fittings and tubing designed for adverse applications. BuTech products are suitable for use in extreme high-pressure and high-temperature conditions, including erosive or corrosive solids, liquids or gases. Haskel employs rigid quality control procedures during all manufacturing and assembly processes, including the application of non-destructive testing to ensure stringent specification compliance. The company’s experience in hydraulic and pneumatic engineering, design and manufacture, in addition to continuous investment in new technology, keeps it up-to-date with the latest high-pressure technology to proactively response to any client request. Haskel’s experienced application engineers offer proven and reliable solutions worldwide. The company supply comprehensive systems to transfer and pressurise fluids, chemicals and industrial gases, including super-critical and high-purity grades. Using energy-efficient designs, Haskel products are available anywhere and aim to safely control, store, hold and generate high-pressure gases and liquids at specified pressures.